"Masky provides some of the most devastating and beautiful imagery"
This is the second of two articles riffing on found footage horror and new media. The first was Sarolta Mezei’s “Found Footage Horror #1: The Dead Rising: Aspects of Spectrality in the Vicious Brothers’ Grave Encounters,“ q.v. With almost 400,000 subscribers on its YouTube channel and its first installment clocking in at well over 3 million views, Marble Hornets has become synonymous with the Internet’s burgeoning Slender Man mythos. Employing the rough hand-held cinematography and narrative conceit of the popular found-footage horror category, its poetic terror stems as much from the haptic quality of its haphazard and often decayed digital textures as it does its enigmatic and frequently impenetrable storyline. 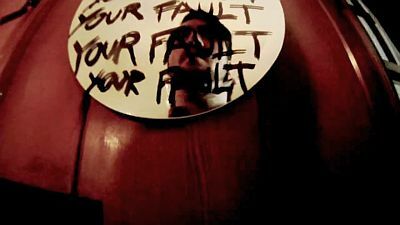 After five years, Marble Hornets is now leading to its finale, a conclusion that will no doubt be as formally and thematically nebulous, brutal, and volatile as the series itself. 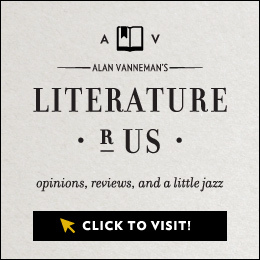 A cursory glance at Tumblr and deviantART might falsely suggest that the prodigious online fan cultures surrounding the Slender Man meme are purely the domain of adolescent fan art and tentacle-laden slash fiction the likes of which would make the most sexually open-minded adult consider contacting law enforcement. 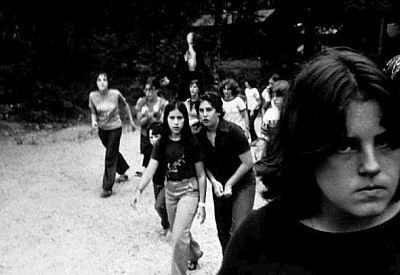 The Slender Man mythology was born deep within the countercultural underbelly of the Internet on the Something Awful forums, the same place that spawned the notorious 4chan imageboard (which itself begat hacktivist group Anonymous and the Project Chanology anti-Scientology movement). It was on the Something Awful forums that a “creepypasta”-themed Photoshop thread played host to two black-and-white images by user “Victor Surge” in 2009 (below). 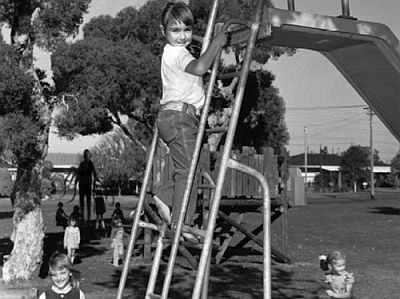 These seemingly innocent photographs of children had the horrific addition of the now-iconic figure of the Slender Man: a tall, thin character with long, tentacle-like limbs in a black suit with a featureless white face. Surge’s origin story constructs the Slender Man as child stalker and kidnapper, but as the legend has evolved, the threat of the Slender Man has become increasingly vague and ominous. The visual construction of the Slender Man has a long and diverse range of historical predecessors, from Salvador Dali’s famous dream sequence in Alfred Hitchcock’s Spellbound (1945) to a figure on the cover of the 1994 eponymous debut album by nu-metal band Korn, and even René Magritte’s The Lovers (1928). The continuing proliferation of this online urban legend has triggered an explosion of user-generated content (UGC), including web series such as EverymanHYBRID and TribeTwelve, and the Slender Man can now be also found in feature films and videogames. 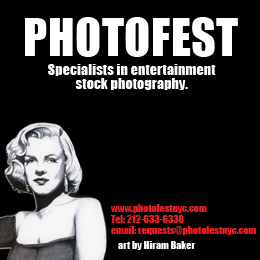 There was interest, and with a mainstream feature film adaptation in the works,1 that interest continues to snowball. With its first series made for a mere $500, these Alabama-based young filmmakers have rendered Jay’s exploration of Alex’s tapes and the complex web of paranoia and terror that followed the Internet’s most significant and sophisticated amateur found-footage horror experiment to date. The earlier entries in the series pivot around Jay’s continued investigation into Alex’s tapes, but as strange events begin to unfold on the tapes – most notably the appearance of the ominous Operator (the name of the Slender Man figure in the series) – attention shifts to Jay’s own bizarre experiences and those who become involved in his investigation, such as Tim (Tim Sutton) and Jessica (Jessica May). While the videos are housed on YouTube, Marble Hornets is complemented by its Twitter account @marblehornets and thus offers a strong example of a transmedia found-footage horror success story. But unlike its better-known blockbuster ancestors – The Blair Witch Project (Daniel Myrick and Eduardo Sanchez, 1999), Cloverfield (Matt Reeves, 2008), and the Paranormal Activity franchise – in the case of Marble Hornets, this approach is not a marketing strategy but rather a wholly organic, naturalized approach to contemporary storytelling. 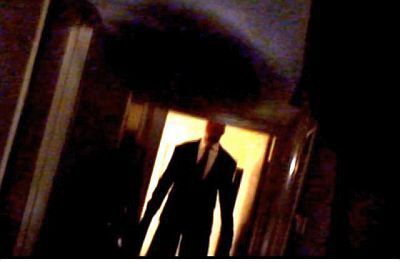 Marble Hornets powerfully indicates just how intuitive transmedia storytelling has become for both creators and consumers, and in doing so blurs the boundaries between these two roles even further as fans of the broader Slender Man mythology that underscore it produce their own UGC. Marked by a sense of fumbling through the dark toward something wholly indefinable, the sensory experience of watching Marble Hornets – dominated as it is by a raw, hand-held camera aesthetic now the trademark of the found-footage horror subgenre – aligns the viewer on a visceral level with what is for all intents and purposes its protagonists’ supernatural wild goose chase. The power of Marble Hornets lies in its gaps and ellipses, stained by an all-encompassing paranoia that at its most overt stops any of its characters from talking openly about The Operator. Unable to trust each other and paralyzed by their own anxieties and fears, this silence extends to the point that there appears to be a pervasive inability for the series’ characters to even discuss with each other the true horror of what is happening to them: Tim and Jay in particular venture to discuss The Operator in only the most guarded of terms (Entry #66, for instance, provides Tim’s long-anticipated backstory, where he refers to The Operator only as “that person in the background or whatever it was”). Despite Tim and Jay’s lives being devastated by The Operator – particularly the mysteries surrounding Alex’s violent and increasingly strange behaviour and his and Jessica’s subsequent disappearance – they are still incapable of discussing him frankly. The voice that Jay (and in the final episodes, Tim) lose in the diegesis of the videos themselves is regained on Twitter, which becomes a vital tool for the Marble Hornets protagonists to not only update their followers on their vaguely defined “progress,” but to receive advice and encouragement (and sometimes abuse) from their followers. In true transmedia style, the YouTube account exists within the series itself: in Entry #59, Tim angrily confronts Jay about his YouTube videos, revealing as they do Jay’s ulterior motives for seeking Tim’s assistance in attempting to unravel what has happened to Alex and Jessica. This episode is noteworthy not only because it contains the first reference to the YouTube videos being online from within the narrative diegesis, but also because it is the first time Jay talks directly to the camera (until this point, his narration had been provided primarily through intertitles). Even more significant, however, is the manner in which the YouTube “reply” videos are announced: Jay’s account is regularly hacked by an anonymous figure who links to short films posted by the anonymous, enigmatic user ToTheArk. Closer in spirit to experimental and avant garde filmmaking traditions than to the verité that marks the Marble Hornets series itself, these “reply” videos are densely packed with intense, abstract imagery and seemingly coded messages that are as sensual as they are ultimately incomprehensible. So what makes Marble Hornets so terrifying? While there is a strong degree of subjectivity to fear as a primal responses, the widespread tendency for the series to frighten its viewers (a claim well documented on social media, especially Twitter and Tumblr) suggests the series’ creators honed in on some fundamental wellspring of terror in their adaptation of the Slender Man mythology. At first, The Operator’s affective impact stemmed from the well-trod and durable terrain of the old-fashioned bogeyman: an indistinct figure who looms in the shadows and whose threat stems largely from the nebulousness of what it is precisely it will do to its (usually child) victims other than “get” them. Jay discovers evidence of this type in the Entries #6 and #11, but the malevolence of this ambiguity is no clearer in the early part of the series than in Entry #14: here, The Operator is shown entering Alex’s bedroom in shadows, but vanishes when Alex turns on the light. Apparently not seeing anything unusual, he switches the lights off and an intertitle states that 32 minutes pass. Suddenly, the camera cuts to a close-up of Alex, who is now bleeding profusely from the head. He is filming himself, but looking off-camera, and the footage is distorted. The Operator’s presence is marked explicitly by his absence within the frame: his danger comes from the tension between being both visible and invisible. As the series progresses, however, its focus shifts from the archives of Alex’s failed film project (and in the second series, the hard drive and tapes he finds in his hotel room safe) to Jay’s obsession with documenting his own investigation into the events that resulted from Alex’s sudden strange behaviour. With this shift, The Operator becomes decreasingly involved directly with acts of violence: bodies (both dead and barely alive) are left for him, and he can cause long-term amnesia in his victims, but aside from a few notable occasions, he rarely is the primary physical threat. Rather, others linked to him enact this violence seemingly on his behalf, culminating in beatings and some distinctly vicious murders. 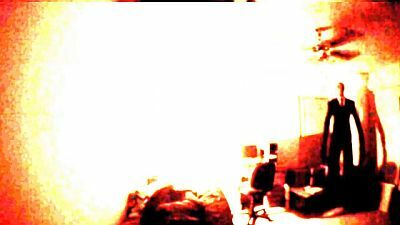 Fans have granted these agents shorthand nicknames: Masky, for example, provides some of the series’ most devastating and beautiful imagery (see above), as well as becoming a cosplay staple in Marble Hornets fan communities. He is joined by Hoodie, identifiable by his eponymous signature hooded sweatshirt that is emblematic of a terror more mundane and ubiquitous suburban than that offered by The Operator (with a reference to Edvard Munch – and perhaps via Wes Craven’s Scream franchise – thrown in for good measure). Far from being abstract fantasy figures, however, these pantomime horror villains are revealed to be the alter egos of Alex and Tim’s friend Brian and Tim himself respectively, the latter unaware of his identity as Hoodie until it is revealed to him when watching Jay’s YouTube videos. Alongside these revelations, Alex’s behaviour becomes increasingly volatile and physically violent. 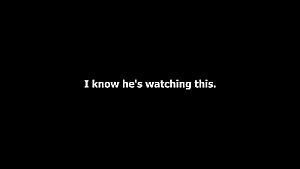 Despite appearing only on occasion, the very title of the series acts as a constant reminder of the centrality of Alex to the horrors that lie at the heart of Marble Hornets. Like The Blair Witch Project, its name is a persistent reminder of the futility of the filmmaking endeavour as a whole as a tool to capture any kind of “truth” or “reality.” The name “Marble Hornets” is a conceptual mantra, hidden in clear view: those words seek to remind the audience that the very thing Jay seeks to do with Alex’s tapes and the story that has arisen from them – to make sense of a nonsensical world through the analysis and construction of a video archive – is ultimately doomed. 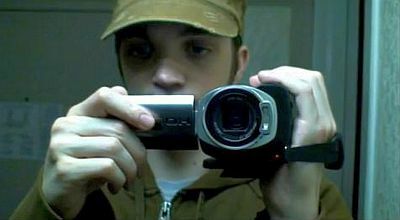 The core narrative tension within Marble Hornets stems from its protagonists’ fundamental desire to reconcile the past with the present: to unravel the secrets that first revealed themselves in the digital archive of Alex’s failed film project, and to identify the links between these and the violence of the present. At the centre of this lies the appearance of The Operator himself, a figure who announces his presence through digital distortion: The Operator is, at his core, a corruptor of our faith in the archive as a method to decipher “truth” (whatever that may be). Due no doubt in large part to the money its creators made from Marble Hornets‘ success as the series progressed, the material construction of The Operator himself shifts from what at first appears to be a puppet-like, tangible real-world presence to something increasingly more ephemeral and digitized. Whether a conscious decision on the part of the series’ creators or not, this is crucial: as the series progresses through to the final episodes of Series 3, The Operator increasingly becomes little more than the quarry in a spooky game of Where’s Waldo: the immediate danger and the real threat in Marble Hornets is technology itself. That The Operator corrupts digital video puts him in direct odds with the diegetic documentary mission that keeps the camera rolling. He stands in opposition to the camera’s promise to capture the truth of the moment, an act its diegetic filmmakers have constructed as fundamental to their ability to understand the past. Marble Hornets may not immediately present itself as a particularly obvious example of the contemporary Gothic, but its found-footage surfaces align it on a near-molecular level with what Leslie Fiedler has identified as the Gothic fascination with “the pastness of the past,” a lush, textured exploration of “the sense of something lapsed or outlived or irremediably changed.”2 At the heart of Marble Hornets lies the horror of the haunted archive, the desire to contain truths that are ultimately uncontainable. Its textures silently aspire to the beauty and tranquillity of mono no aware, but in a culture that has no language for it, all that remains is the disorientation of loss, chaos, and terror. Note: In addition to the hyperlinks embedded in the article, check out this 2011 interview with Victor Surge about the creation of Slender Man and this vital link for anyone new to the series who wants to see them in released order (including the To the Ark videos).